On September 14, 2011, Jensen Farms announced a cantaloupe recall brought about by concern of listeria cantaloupe contamination. So far, approximately 25 people have died from bacteria linked to the listeria cantaloupe recall, which has affected people in 20 states. 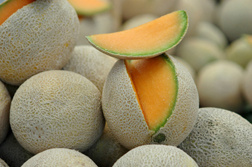 The Rocky Ford cantaloupe were shipped by Jensen Farms between July 29, 2011 and September 10, 2011. Send your Cantaloupe Recall claim to a lawyer who will review your claim at NO COST or obligation. The US Food and Drug Administration (FDA) issued a warning to people not to eat whole cantaloupe shipped by Jensen Farms due to concerns the cantaloupes are contaminated with listeria and could be linked to a listeriosis outbreak. As of October 7 at least 120 people have reportedly been affected by Listeria monocytogenes and approximately 25 people have died. One miscarriage has been linked to the listeriosis outbreak, while four illnesses associated with pregnancy have also been tied to the cantaloupe. According to reports, one newborn was born with a listeria infection. Listeriosis is a rare and serious illness caused by eating food contaminated with Listeria. Symptoms of listeriosis include fever and muscle aches. Although listeriosis is not necessarily fatal, it can be life-threatening to people with compromised immune systems, people with certain chronic medical conditions, newborns, and elderly people. Listeriosis can also cause miscarriage, stillbirth or serious illness when a contaminated product is ingested by a pregnant woman. People who think they may have been affected by contaminated cantaloupe should seek medical attention. Symptoms can take a month or two to appear. In addition to fever and muscle aches, symptoms can include headache, stiff neck, confusion, diarrhea, and/or nausea. Because cantaloupes have a shelf life of approximately two weeks, it is unlikely that any recalled cantaloupes are still on store shelves. Symptoms may still arise. On October 19, the FDA announced that water on the floor of the farm and dirty equipment were likely the causes of the listeria outbreak. Investigators reportedly found samples of listeria bacteria on equipment at the Jensen Farms packing facility. The FDA noted the equipment was corroded, dirty and difficult to clean. Furthermore, pools of water formed near the packing equipment, which may have allowed the bacteria to survive. The equipment was purchased in July and had previously been used to wash and dry potatoes. The FDA also noted that Jensen Farms did not use a "pre-cooling" process to cool the cantaloupe, which may have allowed moist conditions to remain on the cantaloupe, allowing listeria to grow. The cantaloupe may be labeled: Colorado Grown, Distributed by Frontera Produce, USA, Pesticide Free, Jensenfarms.com, Sweet Rocky Fords. The cantaloupes are packed in cartons that are labeled: Frontera Produce, www.fronteraproduce.com or with Frontera Produce, Rocky Ford Cantaloupes. Both cartons also include: Grown and packed by Jensen Farms Granada, CO and Shipped by Frontera Produce LTD, Edinburg, Texas. Not all of the recalled cantaloupes are labeled with a sticker. Consumers should consult the retailer if they have questions about the origin of a cantaloupe. The recalled cantaloupes were distributed to the following states: IL, WY, TN, UT, TX, CO, MN, KS, NM, MO, NE, OK, AZ, NJ, NY, PA. Further distribution is possible. Lawsuits have reportedly been filed alleging people were harmed by the strain of Listeria linked to the cantaloupe recall. Among those are families who say the deaths of their loved ones were caused by contaminated cantaloupe. If you or a loved one has suffered listeria, food poisoning or other side effects from these Cantaloupe, please click the link below and your complaint will be sent to a lawyer who may evaluate your claim at no cost or obligation. Potential Source of Cantaloupe Food Poisoning..
First Cantaloupe Listeria Illness Reported in..
Medical bills and extreme illness for over 11 days!! I have a heart condition!